One of the folks I work with had the opportunity to go to the NSTA convention in Atlanta last month. When she came back, she shared about one of the sessions she attended that discussed having students draw; that drawing was a means of student modeling. To clarify, this has nothing to do with the Modeling Instruction (at least I am not trained in that pedagogy). 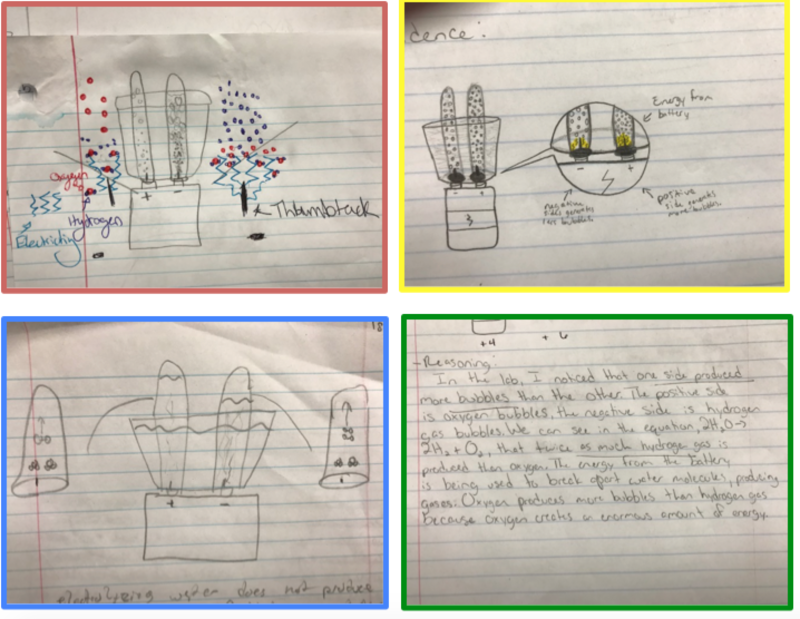 This is simply embracing the idea that students already create an image, create an idea, of what is happening when they observe a demonstration, lab or activity. The goal is to have the students make that model more concrete through drawing; and it seems especially prescient as our state has recently approved the Next Generation Science Standards (NGSS) as the Science standards for all students; and as our district begins rolling them out at the high school level next year. Within NGSS, there is an explicit requirement that students develop models of various scientific concepts. So, the idea that a simple drawing could meet that need was intriguing. I had a reaction rates lab that I thought would be a great trial run for this idea. The students write-up the lab using claim-evidence-reasoning, (CER which has been written about here by Ben Meacham). My goal was to have their drawings help support the ‘reasoning’ component of this write-up. There were four parts to the lab (changing temperature, changing the surface area, changing concentration, and adding a catalyst) and the students had to draw out what they thought was happening in all of the reactions save the catalyst. This initial run with drawings was interesting and I learned a couple of things. The idea was on the right track: the students did seem to make more connections as to why the reaction rates changed. However, their drawings did not get across anything to someone who had not done the lab. This was partly due to a lack of agreement as to what representations to use. I did not explicitly direct the students, there was no discussion, no consensus, about how to draw particles. The lingering question I had then, was whether that mattered: if a student understands their own ‘model,’ is that good enough? I decided to be a bit more specific in what I wanted the next time. The next time turned out to be when we electrolyzed water for the Stoichiometry unit. I probably enjoy this activity more than my students, but this is a perk of being the teacher. Most of the time is actually spent getting the test tubes inverted in the cups without air bubbles, but once that’s done the decomposition of water goes really fast. The students can see a lot more gas being produced on the negative side of the battery when compared to the positive side. This is the first part of their drawing (the test tubes and battery, etc.). On the sides of this drawing, I asked that they draw a particle view of what was happening at each thumbtack. I wanted them to be clear about what they thought was happening at those two places and have that reflected in their drawings. 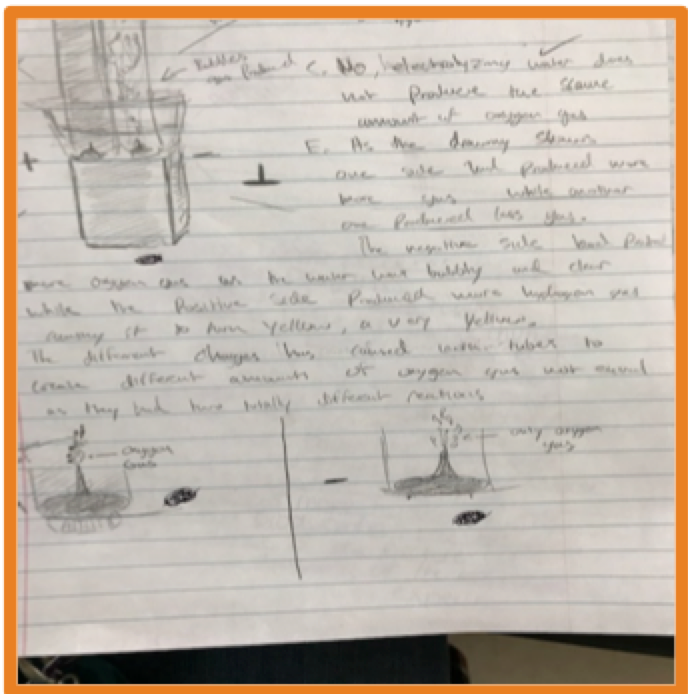 Then, they provided a CER paragraph that incorporated their drawings and explained why there were different amounts of gas being produced as the water decomposed, the clue to this being both the formula of water and the balanced decomposition reaction of water that I provided before we started the activity. Again, there were more lessons for me. First, as this was after we had done a lot with ball and stick drawings and molecular modeling lab/activities, I took for granted that most of the students would see H2 & O2 & H2O and draw the molecular models. This was definitely not the case. Second, I have to make time for peer review on the drawings. While a student must understand their own model, that model is a means of communicating with other people; it has to be clear, it has to be recognizable, it has to be relatively correct. Someone should be able to look at the drawing and figure out what was going on, even if it’s a simplified model. This also leads to the same issue as before: a need to have agreement/consensus on how particles, molecules, whatever, are presented to others. As with anything new, the learning curve is steep in the beginning, but I am still convinced it’s the right thing to do and I’m really excited to attempt to improve the process the next time around.